UNH Revisited 45 Years Later/Anat Cohen Concert Yes!!!! It has been 45 years since I was a freshman at UNH. That’s a long time! This past week, a visit to the campus was a welcome opportunity to relive the past and celebrate the present. David (class of 1970) and I spent two days roaming around campus. 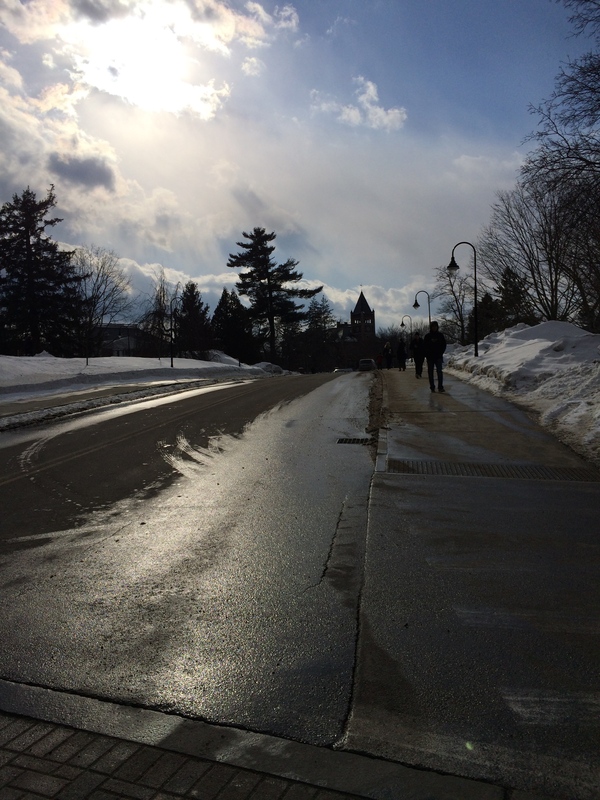 Some things stayed miraculously the same: the crisp white snow, clean sidewalks, many of the brick buildings and extremely friendly students all bundled up coming and going to classes. My dorm, McLaughlin, notoriously nicknamed “Virgin Hill” is still intact, and we even got to see the door of my old room, now adorned with someone else’s bulletin board and boots parked in the hallway. It is no longer an all female dorm; each floor is half male and half female. The pay phone in the hallway is gone, and the common room still has a huge piano and someone playing a guitar. 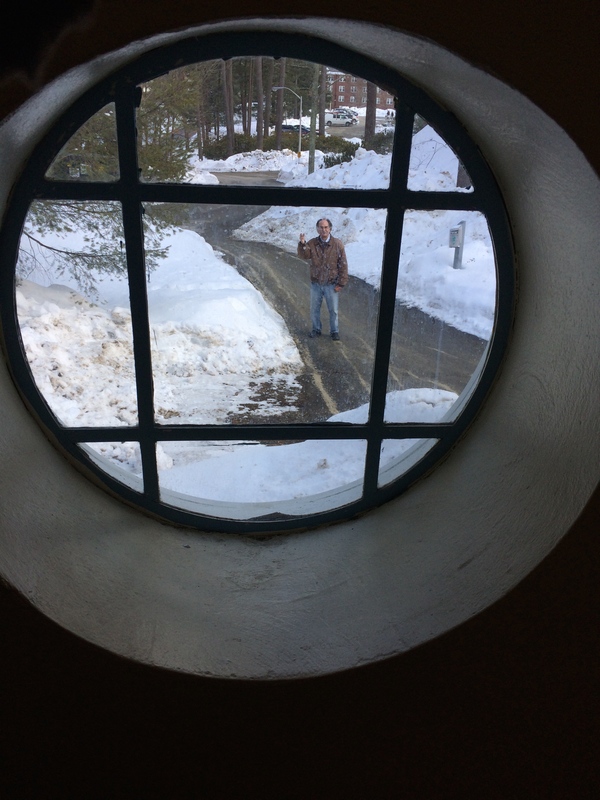 The cute round window that I used to wave to David at 11 pm when parietal hours were over, and he had to leave, was where we left it. Needless to say, there are no parietal hours now! When we were on campus in 1970, we studied in the Physics Library at Demeritt Hall; it was a quiet, quaint place to put our noses in books. How I looked forward to revisiting that old, beautiful building with wide, wooden board floors, tall windows, little cubbies and the smell of old books. We were saddened to see that old Demeritt Hall is gone and buried, and a new, modern building is in its place bearing the same name. It’s a gorgeous building, and we ended up being pleasantly surprised that there are enough students now interested in physics to warrant such a stunning facility. David’s graduating class in the physics department tallied less than a dozen. The building that housed most of my English classes, Hamilton Smith, is standing strong with a few favorite classrooms still as I remember them. Ahhhh… tradition! The cafeteria we most often ate at, Stillings, exists, but the food is significantly different. I remember turkey tetrazini that looked like old string mops and slop. Today’s menu was more appealing than many restaurants. The piece de resistance on campus is the new student union, complete with a dining room that rivals any high end food court or Club Med facility. Every type of food, prepared a zillion ways, with all kinds of alternatives and nutritional information is readily available. Desserts were to die for–they even had a constant supply of warm cookies, right out of the oven. A huge new business school/college fills what used to be empty space and seems to be one of the busiest buildings on campus. A serious network of buses provide transportation almost anywhere. Fritz’s food truck is no longer present, but there’s a cafe serving Starbuck’s coffee always within skipping distance. New England Center was the new conference center built when we were in school. It was a beautiful high rise hotel nestled in a wooded area, with a top notch restaurant that served gourmet food. That is where I took David on a dinner date on Sadie Hawkins Weekend– the one weekend a year when the “girlfriend” paid for the “boyfriend”. Hmmmm… Does that date me or what!!! I bet there’s no more Sadie Hawkin’s Weekend on campus any more. Today the New England Center no longer exists as we knew it. It’s a UNH dorm. There was more need for student housing than for a conference facility. I don’t regret or begrudge any of these changes… how foolish it would be to think that a university would remain static over almost half a century. Oh my, it has been almost half a century since I was a freshman. The visit was a nice way to check in with the past and also get to hear my favorite jazz artist play. 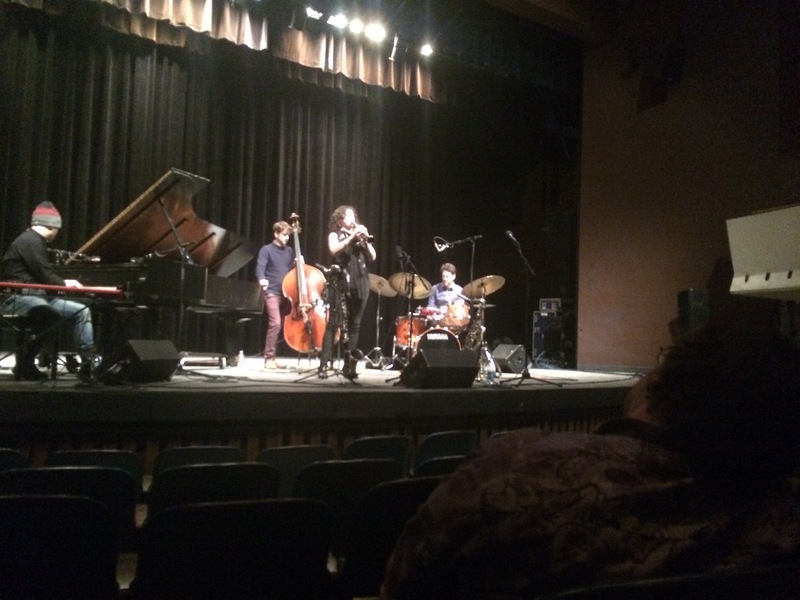 The Anat Cohen Quartet performed as part of the Traditional Jazz Series, sponsored by the UNH Music Department. It was phenomenal. Anat is so vibrant, talented, creative and her group takes jazz to new levels for me. There is no way I can do it justice here, except to tell you that they push through boundaries, blend genres, and make magic happen. Her new CD, entitled Luminosa, is exquisite and exciting. I have it on repeat, and it’s all I’ve been listening to. UNH continues to be good to me, even though I only spent my freshman year there. It was a delightful revisit. Posted in Anat Cohen, create, Explorer of the World and tagged Anat Cohen, UNH. Bookmark the permalink.